Gas price declines of up to 13 cents a gallon continued around the islands for the sixth week helped by free-falling crude oil prices pushed to their lowest levels since August 2017. In Kahului and Wailuku, the average price is $3.80, which is 13 cents lower than last Thursday, 31 cents lower than on this date last month and five cents higher than on this date a year ago. That according to the AAA Hawaiʻi Weekend Gas Watch, released on Thursday. The Hilo average price is $3.46, which is down 12 cents from last Thursday, 36 cents less than on this date last month and 20 cents higher than on this date a year ago. 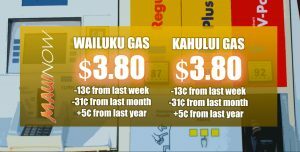 Līhue’s average price for regular is $3.64, which is 10 cents lower than last Thursday, 34 cents lower than on this date last month and 12 cents more than a year ago. 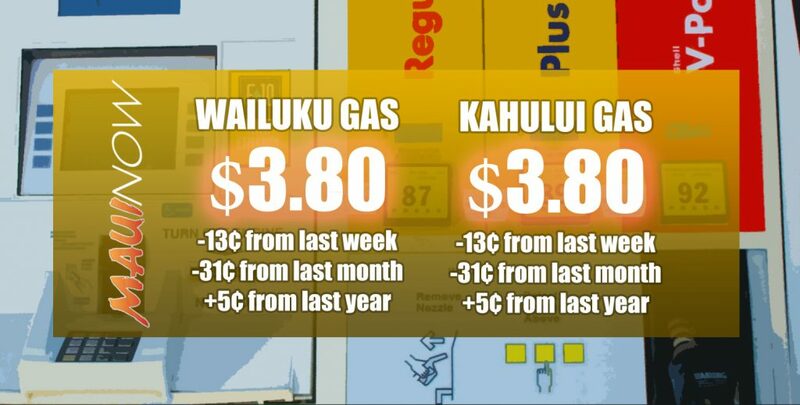 In Honolulu, the average price for regular is $3.33, which is nine cents lower than last Thursday, 36 cents lower than on this date a month ago and 21 cents higher than on this date last year. The statewide average price is $3.46 a gallon, which is 10 cents lower than last Thursday, 36 cents lower than a month ago and 17 cents more than a year ago, according to GasPrices.AAA.com .